John Walsh's New Book, "I'm Not a Duck" is an Enthralling Work About the Struggles That Comes When God Gives Direct Instructions to a Person. 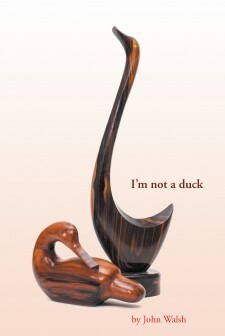 Recent release "I'm Not a Duck" from Covenant Books; author John Walsh - This is a series of heart-warming and inspiring stories about the times John made plans, only to have God reveal a different direction for him. Bloomington, IL, February 21, 2018	(Newswire.com) - John Walsh is an author, speaker, and professional storyteller. He is the founder of BibleTelling, which is an organization dedicated to using Bible stories for evangelism and discipleship. John has completed his new book, “I’m Not a Duck,” a thought-provoking true account of his walk with God. This “walk” included God taking him through learning problems, stuttering, business failure, heartaches, and ultimately personal success. John’s stories highlight the times God stepped in and “showed him something different.” Each time, there is shock and dismay. This book examines the difficulty of balancing his commitment to God while clinging to his own plans. Still, John submits to God each time and finds himself standing in awe of God’s wonderful direction for him. Walsh’s authentic voice about his struggles encourages readers to have an undergirding commitment to God, especially in light of all the skirmishes that life brings. Published by Covenant Books of Murrells Inlet, South Carolina, John Walsh’s new book is a gripping work written in a casual way that invites you to pour a cup of coffee and join him on the front porch. He will touch your heart with his hard-earned insights and delight you with his adventures around the world. Readers can purchase “I’m Not a Duck” at bookstores everywhere, or online at the Apple iTunes store, Amazon, or Barnes and Noble. Covenant Books is an international Christian owned and operated book publisher based in Murrells Inlet, South Carolina. Recent release "Finding Faith in a Closet" from Covenant Books author Shannon Hodge is an evoking narrative that contains a journey through conflict and how faith is restored and how resolve is rediscovered. Catherine L. Weaver's New Book "Seasons of Time" Contains an Evoking Collection of Insights That Inspire Readers to Live a Fulfilling Life. Recent release "Seasons of Time" from Covenant Books author Catherine L. Weaver is a stirring book that treasures wise words that hope to invigorate heart and souls into living a purpose-driven life. Recent release 'Near Dawson Creek' from Covenant Books author Don Wright is an enthralling read that delves into a life filled with profound moments.